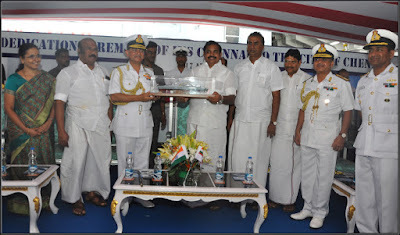 INS Chennai, a P 15A Guided Missile Destroyer of Indian Navy, was dedicated to the city of Chennai in the presence of Shri Edappadi K Palaniswami, Hon’ble Chief Minister of Tamil Nadu, Dr D Karthikeyan IAS, Commissioner of Chennai and Vice Admiral HCS Bisht, Flag Officer Commanding-in-Chief, Eastern Navel Command at an impressive ceremony held onboard the ship at Chennai Port Trust on 17 April 2017. 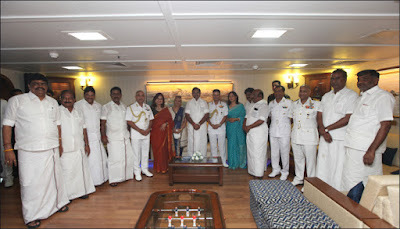 On his arrival, the Chief Minister was received by Vice Admiral HCS Bisht. 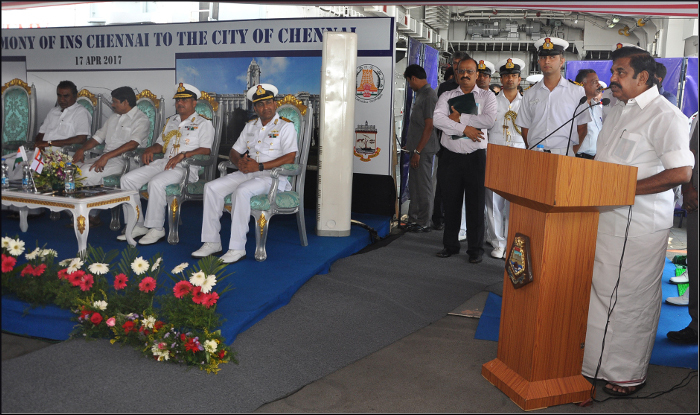 During his inaugural address, Vice Admiral HCS Bisht stated that the Indian Navy is fully geared up to meet the challenges at sea due to potent weapon platforms like the Chennai. 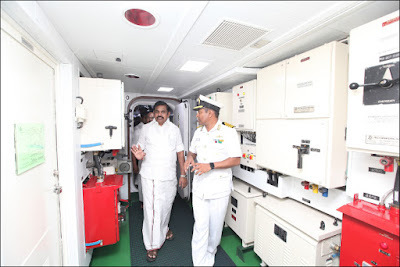 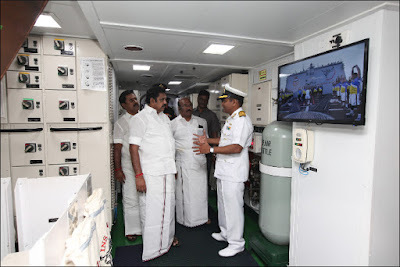 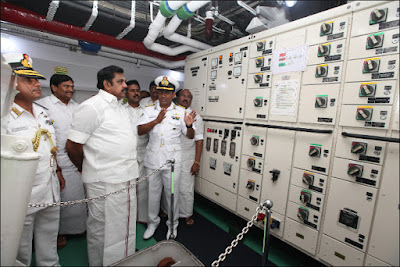 He reaffirmed the Navy’s commitment towards the Government of Tamil Nadu and provide help to the people whenever called for. 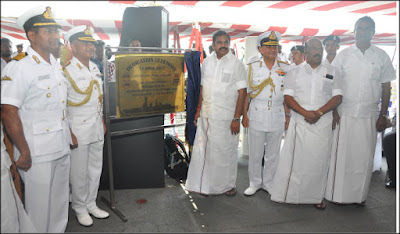 The event was characterised by closely coordinated sequence of drills and events leading to formal unveiling of the plaque by Hon’ble Chief Minister. 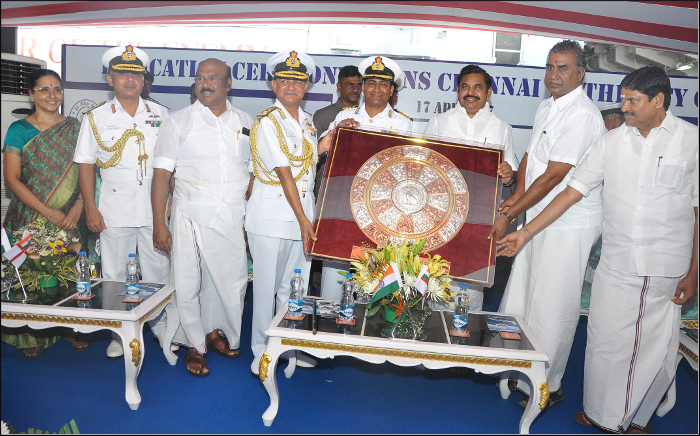 On completion of the dedication ceremony, the Hon’ble Chief Minister presented a memento to the ship which will not only find a suitable place but also remind of the association the ship has with the city of Chennai. 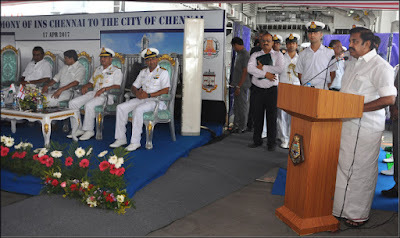 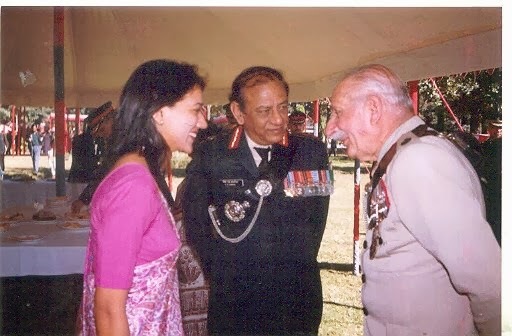 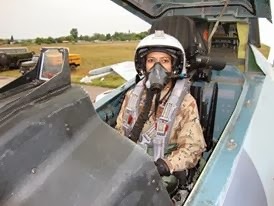 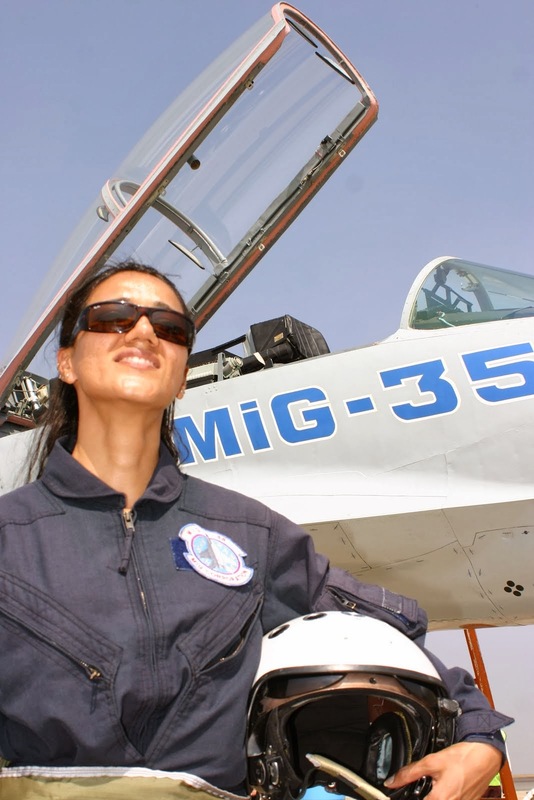 The ceremony was witnessed by a large gathering which included VIPs, dignitaries, Senior Officers from the three Defence Services, Coast Guard, Police Officials from Central / State Government, Corporation of Chennai, Chennai Port Trust, Industry, Academia and retired Naval Officers, Consul Generals and other dignitaries. 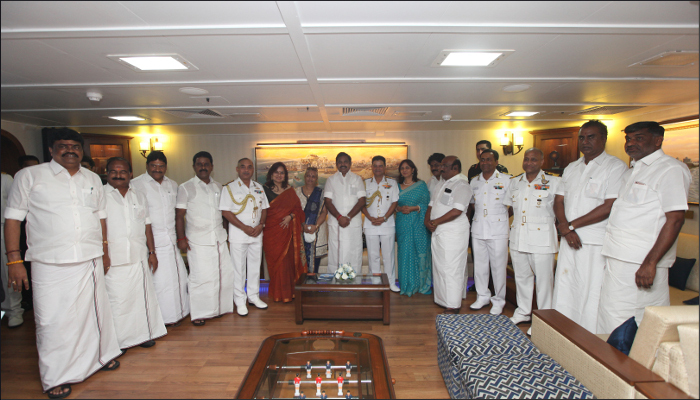 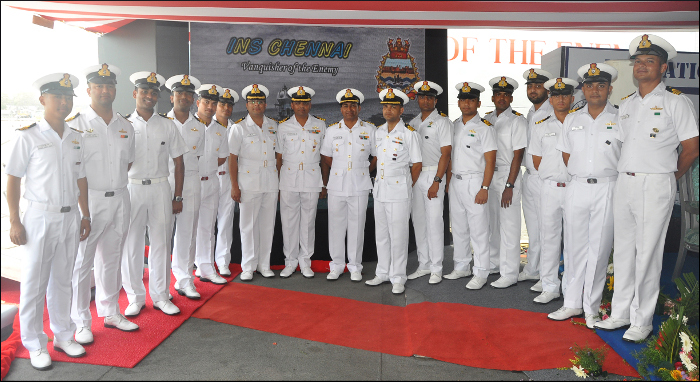 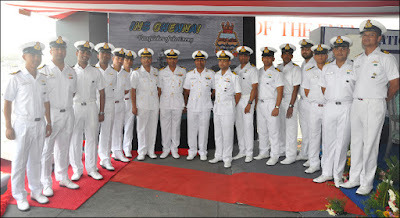 Named after the iconic port city of Chennai, the ship has a complement of about 45 officers and 395 personnel. 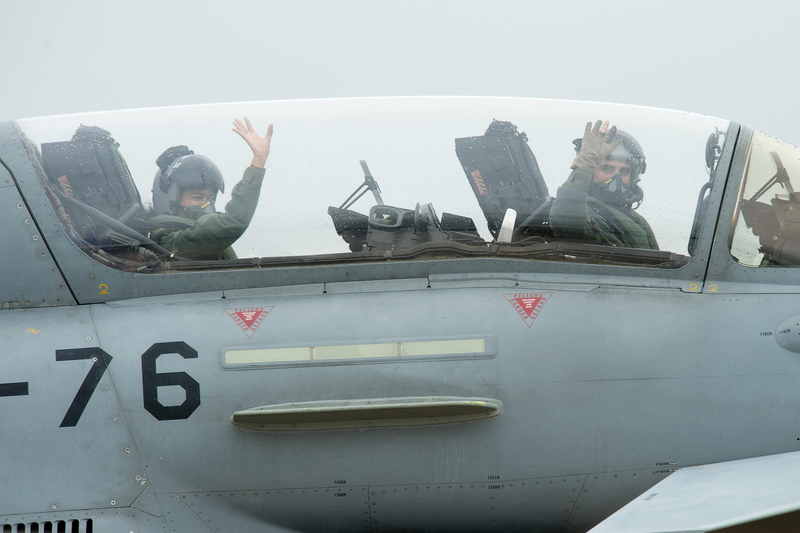 The ship is under the command of Captain CR Praveen Nair.